A few weeks after an old lady attacked my bookstore owner friend (Eddie of Dencan Books) with the crumpled-up ball of my work comes word of a fresh complaint. Stockings and garters and heels -- oh my! 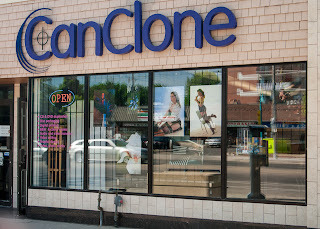 A number of my more recent images, printed on canvas and framed, are hung in a store window down on Lakeshore Road in Toronto. When Candi and Jim, the store owners, put them up I warned them about the Bookstore Versus Little Old Lady episode and pointed out that two of the images in their windows were large renditions of my pin-ups. 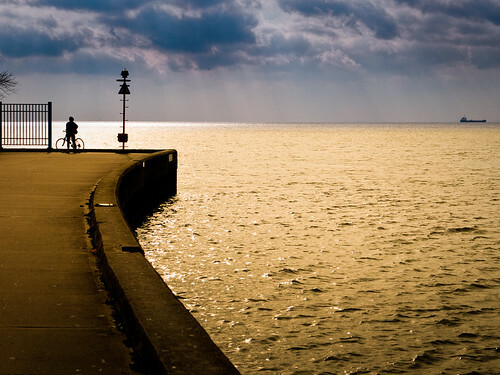 They laughed and said something to the effect that "Oh don't worry: this is the Lakeshore. Anything goes here." So apparently last Friday a dual-ponytailed young woman, 19 or 20, came into the store and waited patiently to get Candi's attention. She insisted that those pin-up images were inappropriate and should be removed from the window. Candi said "rubbish" and the girl said, "but they are in their underwear -- women and children could see them!" Candi, displaying her stubborn and mischievous streak, retorted that there's an enormous illuminated billboard down near the Gardiner Expressway (a 6-lane elevated highway that runs right through downtown Toronto) showing a man wearing only his Stanfield undershorts and that if she could get them to remove that, Candi would remove my pin-ups. Dorothy, a photo by Bruce M Walker on Flickr. A portrait image from my recent Hollywood Glamour themed shoot. The key light here is a ringlight installed inside an 18" softbox, attached to a monopod and hand-held a few inches above Dorothy by my assistant. Keys, a photo by Bruce M Walker on Flickr. Another image from the Hollywood Glamour creative shoot I did with Dorothy Weiss at the end of May. If you have ever bought one of those inexpensive wireless triggers through Amazon or from eBay, like the great little kits from Cowboy Studio, you may have wondered what to do with the little cable that comes with it. The Cowboy Studio NPT-04 kit ships with one that has a PC sync connector on one end and a 2.5mm micro plug on the other. There are actually a few uses for these cables. The manual suggests one: wireless triggering from cameras that lack a hotshoe but have a PC sync outlet; eg medium format film bodies. But also, with a 2.5mm micro jack to 1/4" plug adapter, you can connect the output of one of the receivers to the sync input on a studio strobe or monolight and fire that wirelessly, perhaps at the same time as one or more speedlights in a complex setup. 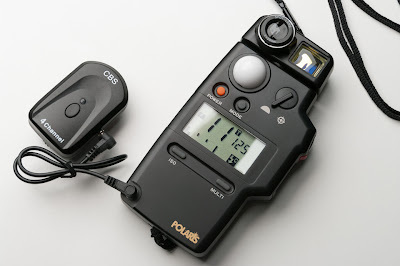 But today I discovered yet another really handy use: connecting a wireless trigger to your light meter and get an instant flash meter reading capability! This will work with any flash meter that has a PC flash sync outlet and a function for doing "cabled" readings. My Shepherd/Polaris meter (Dual 5 aka SPD500) has this capability (select Cabled Flash via the Mode button), and so does the Sekonic L-308 and L-358. I imagine that any decent modern flash meter does. Doing this simplifies the two-step process of first arming the flash meter then manually triggering the flash(es). Instead, all you do is push the measure/trigger button on the light meter; the flashes fire, and you have your reading. This works especially well if you have a spare trigger as you can leave it connected and dangling from the light meter. This means not having to worry about forgetting to replace the trigger on top of the camera like I seem to do over and over during a busy shoot where I'm frequently altering the lighting setup and needing to re-measure. So for those of you not used to this, here's what you do. You will setup your lighting arrangement, stands, umbrellas, softboxes, etc., making sure to pop wireless receivers onto the hotshoe feet of all your flashes and turning them on. Set your camera on manual, dial in for example, ISO 100, 1/125th sec shutter and set the flash meter to match those settings. Then when you are ready to measure the light to get the correct aperture, you merely hold the meter near your subject's face with the dome toward the light and press the Measure button. POP! (that's the flashes going off.) Now you will have the correct aperture to use on the meter display. Aren't you glad you didn't throw that little cable away? You did? Whoops! Well be sure and keep the next one. A little rant for today. I decided to get a slightly more modern cellphone on the weekend. You need to know that I am one of those curmudgeons who only uses a cell sparingly and only for making actual phone calls--short ones like "I'm going to be late". I'm also really cheap and I hate the ridiculous fees charged by the local incumbent telcos for voice and data plans and refuse to be taken by them. This means that I only buy older tech and use a pay-as-you-go "plan" to keep it configured on their networks. My old Motorola V120c, new in October 2001, likely one of the oldest cellphones in existence still in working order, is holding less battery charge lately. And since the 60 day air-time top-up was due, I figured time for a new one. I had done my homework: all the pay-as-you-go plans out there rely on you forgetting to top-up and therefore losing your accumulated minutes. "Oh gee, too bad, boo hoo! - say those a-holes at Rogers and Bell. I had discovered that 7-Eleven sells phones, mostly Nokia, and SIMs that connect to the Rogers network. Their pay-as-you-go plans expire after a full year, so you don't have to remember to top-up so often. Seemed like the least expensive solution. I wanted to be able to sync my Mac's address book to this phone so I made sure to select a model with Bluetooth, the Nokia 2720 Fold, a new model in September 2009. If you're a well-read Mac person you may be groaning inwardly now. Yeah, I have since discovered that Address Book sync'ing on the Mac is problematic, older phones aren't supported, and the coup de grace: Apple has completely removed syncing suport from Lion, the latest OS. Luckily, I'm still running Snow Leopard, I was able to figure out how to hack one of the newer phone-plugins to fool iSync into accepting my 2720 and sync to it. if I want to upgrade to Lion, I can get temporary relief by copying iSync.app and my DIY plugin over to it after the install. But this took all of Sunday and most of today. Plus I've learned one of the critical reasons why Apple sells so many iPhones: the Nokia phone is one of the most exasperating devices ever created. I have become really adept at removing the rear cover and extracting the battery. That's the way you get the phone's attention in a number of use cases. For example: fire up the FM radio and listen to it for 5 to 10 minutes. The phone's user interface becomes completely unresponsive. Pull battery, wait a few minutes, replace, reboot. Tinker with Bluetooth software -- pull battery, etc., etc. I've also learned that I'm somewhat clairvoyant. I can see quite clearly that this phone is going to die by being submerged far out in Lake Ontario at some point in the future. Maybe then I'll overcome my extreme frugality and get an iPhone. The Boss from Alex Emslie on Vimeo. Frolic, a photo by Bruce M Walker on Flickr. Why is Marzi so happy, you are wondering? 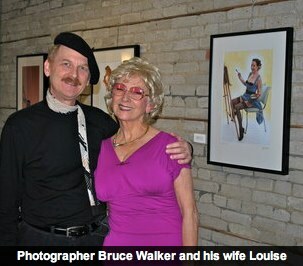 It's because my Postmodern Pinups exhibit is now held-over for the entire month of June, that's why!